Annuals: Outside of the 'Bonfire' begonias in hanging baskets and my veggie plants, only a few little portulacas have been allowed to bloom! They are all so recently planted that I have been pinching out the blooms in order for the plants to put down good roots and get through the promised heat of summer. That's all for this Bloom Day--for me, anyway! 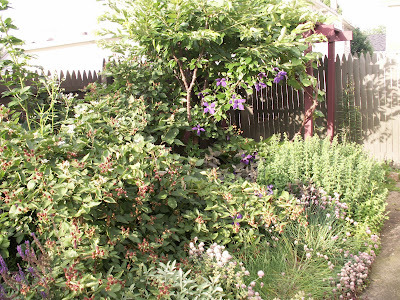 To see what other colors abound in gardens around the world, visit the Garden Bloggers' Bloom Day Post for June 2010, hosted by Carol at May Dreams Gardens! 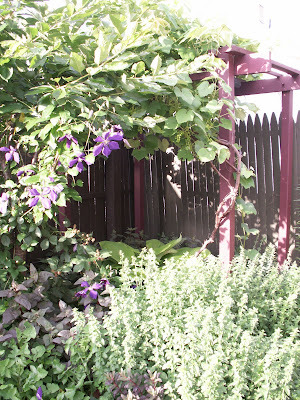 Amazing clematis -- hope the overcrowding will sort itself out. Happy bloom day! I keep trying to grow clematis up problem trees and all I seem to get is problem clematis. Enjoyed the fact that your images give views of the garden and not just plant close-ups! I do love purple in the garden. I'm saving my purples for Foliage Followup. 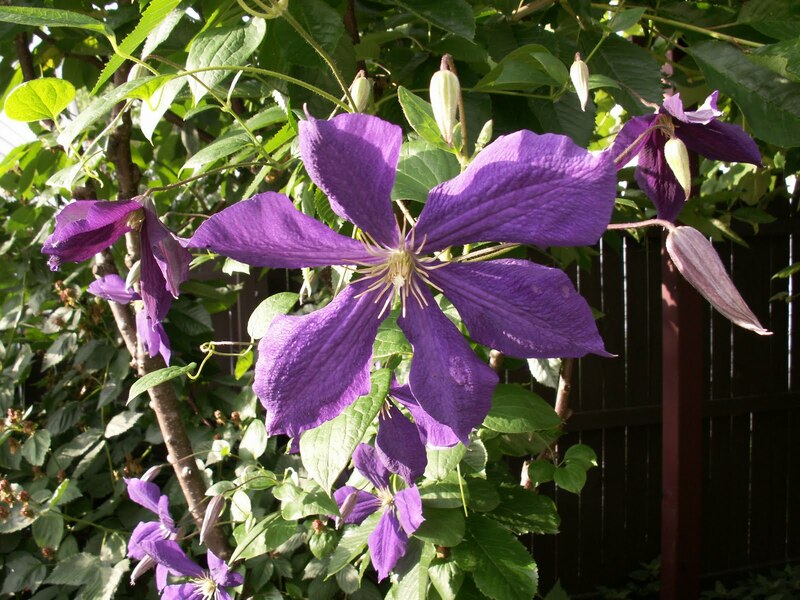 I agree that your purple clematis looks like Jackmanii. Jack is blooming in my garden too. I had some purple I didn't show! now I'm a little bit regretful! loved seeing your blooms. What do you do with your fruit? Good luck with your clematis. Maybe the bing thinks he is helping LOL. Thanks for sharing your garden. Hey, Kim...great name! :) Your purples are beautiful. It's one of my faves in the garden. I especially like your colored grass. THIS is so cool, because I have all blues/purples today, too, but NONE of the same as yours. I LOVE the tall verbena! And the clematis. Clematis is not so happy in my garden. I keep killing it. 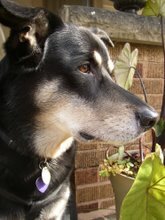 Beautiful clem. 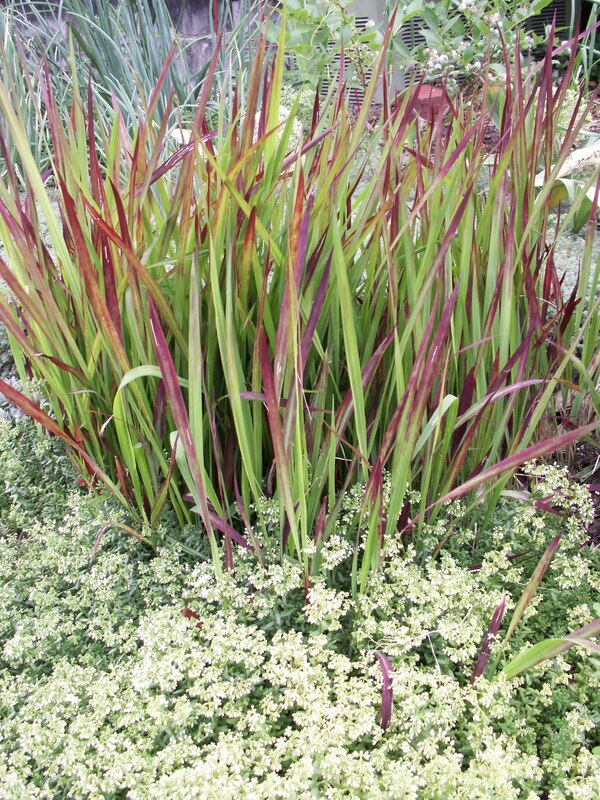 My fave would be the sedum and -- is it blood grass? What a lush, beautiful garden. Happy bloom day! Makes you wonder what will be left to bloom in August. I'm with you about white flowers, although I do leave my Hosta flowers alone. It's too funny that this weather has caused a miraculous resurrection of the tree. Like Linda, I've had problems getting a Clematis to grow up a tree. 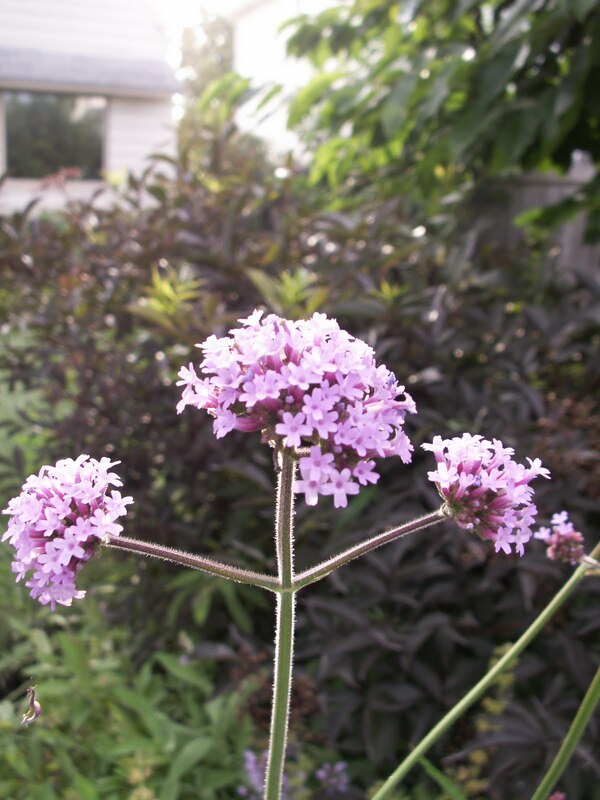 My problem was the horrible wind we had in April and May, which broke the precociously growing stems. I have a much shorter plant now. 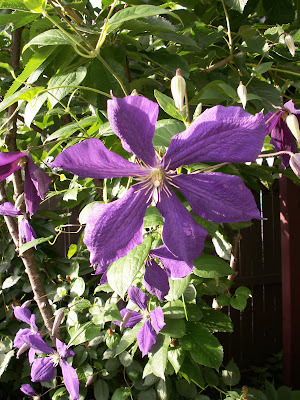 In your abundant spare time, you could try to ID your Clematis through Clematis on the Web's Clematis search function. How strange that some things bloomed early given the late winter! I for one can't figure that kind of thing out. I love your clematis....I want one now! NellJean, I'm pretty sure I'll have some purples for Foliage Followup, too. I (heart) purple! Kimberly, right back atcha! LOL. 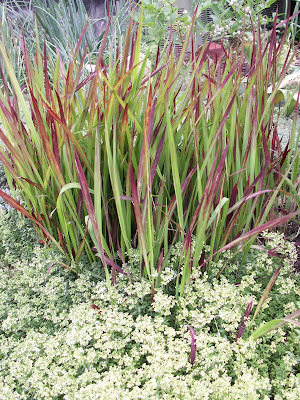 And thanks--I love that bloodgrass, too! Katie, this is really the first year the clematis has looked like anything... I don't know how to explain it! But I can't wait to go see your blues and purples, too. Thanks for stopping by! Thanks for the link, MMGD! I leave a very few of my hosta flowers alone, but this year I also made a point to plant a few of the varieties that have fragrant flowers so I can use them in bouquets inside. That way, they won't completely go to waste. Yeah, I wonder what will be left to bloom in August, too. But it makes me glad that my garden tends to come into its own in the fall! Love your purple and green palette. And the clematis is lovely. That red grass in the sea of white flowers is brilliant. That's the M.O. of all my plants. Leave them for dead, and when I have a plan for it, it springs to life. I love that grass. Is it benikaze? I may have it. It's struggling on my back slope. Great clematis! If every purple bloomer I planted lived and grew, all my GBBDays would be very purple, Kim - but so many die or bloom pink or wimp out. Just a thought: Maybe the clematis really does enjoy being supported by a leafed-out Bing better than the bare branches? Those vine are so darned brittle! Could be the leafage cushions against small breaks when the wind snaps at the vines. Zwieweltenkind? Love that you've stuffed that huge, frothy aruncus into the garden.